Teacup Yorkshire Terriers do they exist, is there such a breed??? ?….We are often asked these questions. The answer is NO. It is not a special breed. There is NO SUCH BREED as a Teacup. There is only one breed and that is YORKSHIRE TERRIER occasionally a very small one will come along in a litter as will a larger Yorkshire Terrier. Ethical breeders do not use the term Teacup, Miniatures, Tinies, Doll- faced, or Teddy Bear. These are terms used by unscrupulous breeders as a marketing ploy to sell their puppies. The very small ones are more susceptible to health problems. They can get diarrhea and become sick very quickly. They can also have hypoglycemia, open fontanels or seizures. If at any time they have to have an operation or need to have their teeth cleaned they will have to be watched very closely as they can have a reactions to the anesthetic and have been known to die during the procedure. These are just a few problems that can occur. Because of the health problems they can have they often do not have a long life span. The very small ones are not suitable around young children. They can be tripped over or trodden on. They can jump from ones arms or jump down off the furniture and do them selves a terrible injury. A larger Yorkshire Terrier makes a more suitable pet around children. They are not as fragile and are able to join in most of the family fun and activities, but please remember they are not Toys. Most Breeders breed with females 2.3 to 3.2 Kg or 5 to 7 pound and males 1.8 to 3.2 Kg or 4 to 7 pounds. In this way, we can keep our breed healthy, free whelping and with the minimum of health problems. 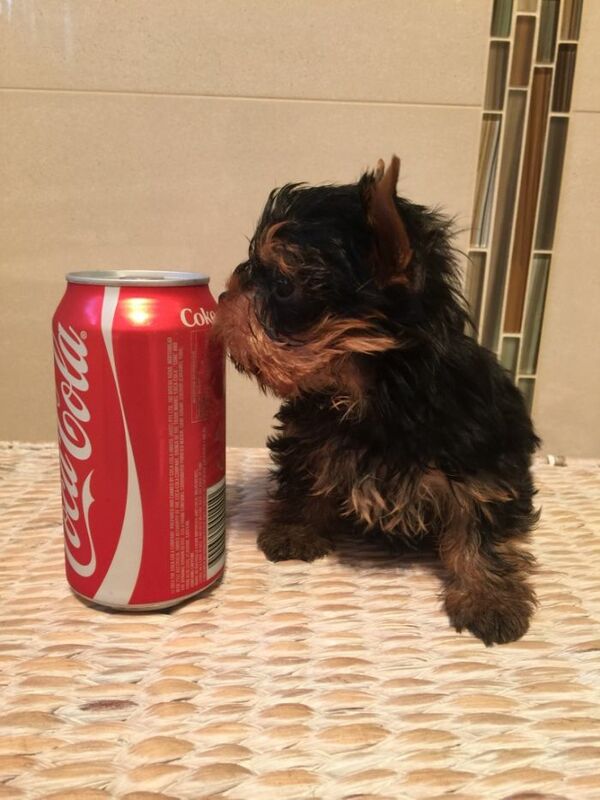 No responsible breeder would intentionally breed to produce very tiny Yorkies. “Teacup Yorkies” or any of the above terms could result in health issues for your new Yorkshire Terrier. Please keep this information in mind when looking for your new pet.